Charles M. Keith, the subject of this sketch, was born November 28, 1903, at Rinard, Illinois. 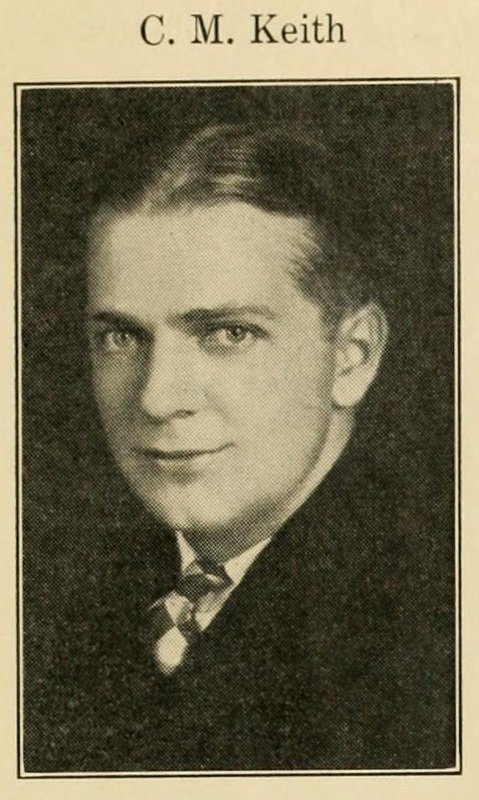 His father, Earl Keith, who is well known throughout this community as an extensive land owner and stock raiser naturally brought to Charles a knowledge of farming, along with his school education, which was completed at the Millikin University at Decatur, Illinois, 1922-1926, where he graduated in commerce and finance with B. S. degree, after he had graduated from the Flora high school with the class of 1922. After his high school and university work was completed he accepted employment with the Sexton Manufacturing Company at Flora as manager of order department, remaining with the company about a year when he accepted a position with a chain store company as manager of one of their stores in Flora. He had only served this company one year when he came to Clay City in June, 1929, and took charge, as manager, of the Clay City Lumber & Hardware Company, the business formerly owned by a number of stockholders and purchased by Earl Keith, in 1928. Mr. Keith, upon entering into the new line of business here, began at once to exercise his business ability and talent, with the assistance of his able clerk. Will Bradley, who had had previous experience in the line of merchandise handled by the company, in building up the business. He began at once letting the people know that they had the goods, the price and would render the service — he believes in advertising. The store room was remodeled, brightened up with paint, stock rearranged and displayed and it seems that Mr. Keith (and Bill, for Bill is always found busy in adding to the appearance of the store and the displaying of light as well as heavy hardware in such a manner that it is really attractive) have been untiring in their efforts to render a service that their patrons would really appreciate and long remember.